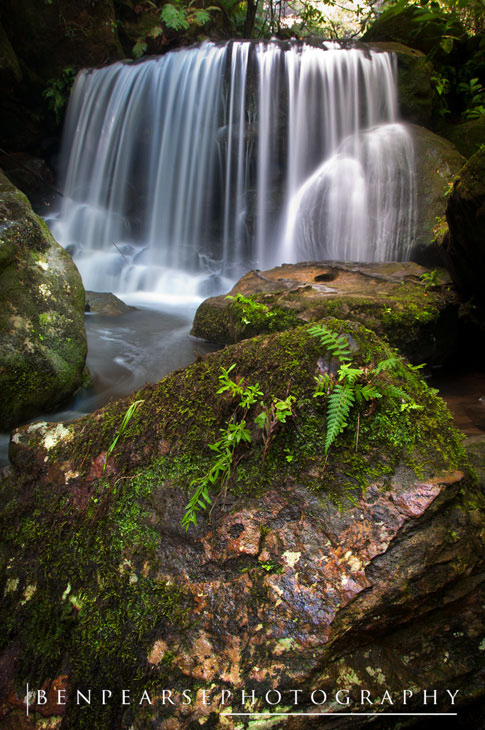 Located down from Leura Cascades and under Bridal Veil falls in Leura, Weeping Rock is one of my favourite places to shoot waterfall photos. After arriving on this location I proceeded to get into the swing of things by wading into the water as usual. At one point I was up to my chest to get the angle I wanted for another shot. It was about then that I realised my phone was still in my pocket and currently 3 feet under water! So realising that the phone was probably stuffed by now I continued getting the shot I wanted and then went back to dry ground to see what sort of shape my blackberry was in……..I guess I wont be taking calls this afternoon then, totally soaked and beyond repair. So you will be sure to see more shots from this great location. This print is available for purchasing here.